this one is a much finer hemp cording, and it’s so lightweight, great for warm weather. 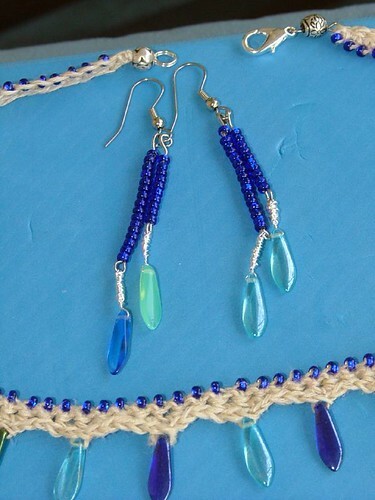 i love the wire wrapping on the earrings, too- i’m going to be doing some more with that soon. i’ve been working on my bio for another project i’ll be starting soon, top secret for now, but soon to be in the public domain. i’m super excited about it, more to come! This entry was posted on July 20, 2006 at 2:33 pm and is filed under crafting, musings. You can follow any responses to this entry through the RSS 2.0 feed. Both comments and pings are currently closed.